When using Coviu, one of our aims is to give you and your customers the best quality live video call experience possible, which includes (among other things) providing a high quality video and audio experience. However, one of the biggest impactors on the quality of a call is the network conditions of each of the participants in the call, where factors such as the amount of bandwidth, latency, packet loss, and jitter all contribute to the quality of the connection, and therefore, the quality of the video and audio that can be transmitted and received. You shouldn't have to worry too much about any of these, as at Coviu we believe in a philosophy of "it should just work" - and for the most part, Coviu will attempt to automatically adjust your call settings to meet your available network conditions. If you'd like a little more control over things, however, and as video is the largest component of the network traffic that is sent during a call, we do provide the option for you to manually adjust your video quality settings. Changing your video quality settings is done in-call by going to the Settings menu, and then selecting the Select video quality option. (you should see something similar to the image below). Note: Not all platforms support changing of the video quality - if you do not see the video quality options, you are probably using a browser (such as Safari, or older versions of Chrome/Firefox) that does not support this feature. 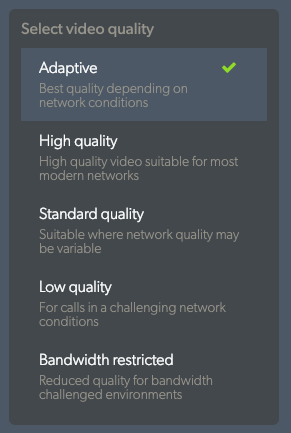 Using these options, it is possible to change the quality of the video you send to other participants in the call, which can provide for improvements to your overall call quality - for example, moving to a low quality video setting may result in improved audio in poor network conditions. This is the default behaviour and will result in Coviu automatically adjusting video quality settings depending on the available network conditions. In high quality mode, Coviu will attempt to send video at 30 frames per second (FPS) with a minimum resolution of 640x480, and an ideal target resolution of 960x720 (although higher is possible). If you are using Safari, the video sent will be a maximum resolution of 640x480 due to browser constraints. In standard quality, Coviu will attempt to send video at 30 frames per second (FPS) with a minimum resolution of 480x360, with a target and maximum resolution of 640x480. Low quality starts to sacrifice video quality in an attempt to preserve audio quality, and as such attempts to send video at 30 frames per second (FPS) at a minimum resolution of 160x120, and with a target and maximum resolution of 320x240. In bandwidth restricted mode, chances are you are operating beneath the recommended minimum network requirements for a video call. In an attempt to establish and hold a successful call, this setting will further sacrifice video quality and smoothness in an attempt to prioritise audio. In this setting (for non Safari users), video will be attempted to be sent at 20 frames per second (FPS), with a target maximum resolution of 160x120, with no minimum resolution. If using Safari, due to an inability to support video resolutions below 320x240, video will be sent at 15 frames per second (FPS), with a target resolution of 320x240. It should be noted that the video quality settings represent (in most cases) the upper bounds of the acceptable quality of the video to be sent. In the event that your network conditions are unable to meet the quality settings you specify, Coviu may attempt to adjust the video settings to meet the detected network conditions. If you move to a better quality network, you should reset your setting to the "Adaptive" setting to make sure you get the better resolution.